The Force took justifiable pride in the state-of-the-art Police Headquarters (PHQ), which served to reflect "our commitment to continuous improvement and our strive for excellence", said Commissioner Lee Ming-kwai at the opening ceremony of the new PHQ on March 12. The completion and opening of Arsenal House and the adjacent new Central Police Station were a source of great gratification to the Force, he added. 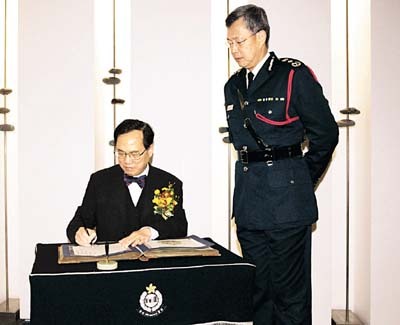 The Acting Chief Executive, Mr Donald Tsang, officiated at the opening ceremony, accompanied by the Secretary for Security, Mr Ambrose S K Lee and the Commissioner. The Commissioner said the new complex cost $2.08 billion, one-third less than the original budget of approximately $3.23 billion, and took nearly four years to construct. "Upon completion, more than 3,800 officers and civilians from formations previously accommodated on leased commercial premises and Headquarters units scattered on various police premises are now accommodated here. This not only achieves significant savings of up to $34 million in rent annually for the Government, but also enhances our overall efficiency by pooling our resources under one roof. "Our public interface offices, including the Police Licensing Office, Media Briefing Room, Crime Prevention Bureau's Display Room and Recruitment Division's Reception Office, are now all housed in this new complex. The adjacent Central Police Station also provides customer-oriented and quality service to the public", he added. Mr Lee pointed out that operational efficiency and service to the public had been enhanced by the extensive use of new technology within the complex. "The complex is installed with modern combined fibre optic cables and computer flooring. This will provide a platform to facilitate our continued benefit from current and future information technology developments. The Auditorium, Multi-Purpose Hall, and conference rooms are all fitted with advanced audio-visual equipment and video-conferencing functions," he said. Referring to the 15th Interpol Symposium for Heads of Police Training to be co-hosted by Interpol and the Force in the new complex in a few days, Mr Lee said: "This will be the first time the conference is held outside France. Delegates to the symposium from over the world will gain first hand experience of the advancements made not only by Hong Kong as an international city, but also by the Hong Kong Police as one of the most modern police forces in the world". In closing, the Commissioner thanked all those involved in the project since its conception for their "painstaking efforts in making this huge development project possible".